Reacting to Bill Johnston's sacking of the Sir Robert Peel, his proclamation of war, and his near-hero status among Americans, the United States and the British in colonial Canada each dispatched a small armada to find Johnston. More than any other, one man dearly wanted to see him hang. By 1838, Lt.-Colonel Richard Bonnycastle (September 30, 1791-November 2, 1847), later to become Sir Richard, had established himself as a capable officer and Renaissance man. He became a Lieutenant before his 18th birthday. He served in the Napoleonic War and the War of 1812. In 1818, he published his first book, a history of Spanish America. He was posted to Toronto in 1832 and established himself as a patron of the arts and advocate of higher education. People spoke of his gifts for geology and astronomy. 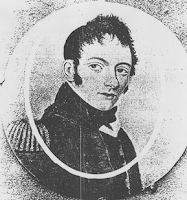 Bonnycastle was promoted to Brevet Major in 1837, the same year he arrived in Kingston to complete construction of Fort Henry. As a Lt.-Colonel in the militia, he found himself fort commandant when the Upper Canada rebellion began. Bonnycastle saw catching and punishing Johnston as his duty. He had succeeded well at every task and challenge, and he was not about to let a river pirate spoil a perfect record. He ordered armed steamers to patrol the main passages of the Thousand Islands and rowboats to poke into the lesser channels looking for any evidence of Johnston. As Bonnycastle wrote in his posthumous 1852 book, Canada, As it Was, Is and May be, the effort paid off. "I sent one of my adjutants…on a secret expedition to discover where the boats were concealed. The foe was off, but he found their bivouac on an almost inaccessible islet near the most narrow part of the channels of the Thousand Isles at Fiddler's Elbow, and cleverly constructed inclined planes upon which these fast-rowing boats had been drawn up." Bonnycastle hatched a plot to capture or destroy Johnston and his crew. Under cover of night, he loaded a company of militia onto a steamer in Kingston and ordered them to remain out of sight. The next day, he set out under the pretext of visiting all military posts between Kingston and Prescott. His officers sauntered about the deck as a military band played. At night, the ship's lamps blazed. Using the boat as bait, Bonnycastle was begging Johnston to attack. Johnston obliged, though not in the manner Bonnycastle expected. On a moonlit night, Bonnycastle's ship steamed upstream through Fiddler's Elbow on the return voyage. Unknown to him, Johnston has anchored two crude naval mines—watertight black powder kegs with flintlock detonators suspended from floats—in the narrowest part of the channel. With the ship a mere dozen yards before the first mine, an officer spied a floating object and shouted a warning. The helmsman swerved the ship in the narrow channel and avoided both mines and the channel's deadly stone palisades. Aside. Fiddler's Elbow is a narrow, cliff-lined channel at the end of a wide St. Lawrence bay. The river sluices through it like water in the narrow end of a funnel. Eddies peel off from the jutting shore and currents boil off the bottom. Bonnycastle's helmsman showed tremendous skill that night. Bonnycastle's plot failed because Johnston knew it was a trap. A well-placed informant in Kingston had warned him of the militia below decks. Bonnycastle had a good idea who Johnston's informant was, though he never mentions him by name. From then on, Bonnycastle's men watched Johnston's man day and night. "Suffice it to observe," Bonnycastle wrote, "that the most interested party never stirred without my being acquainted with his motives; and that whenever we prepared to take the field, a false movement on his part would have instantly cost him his life, so well was he watched and guarded." When Bonnycastle resumed his search for Johnston at daylight, the mines had vanished. Likely, an amused Johnston watched his foe's vain search from one of many sheltered lookouts that dot the then uninhabited islands upstream from Fiddler's Elbow. Canada As It Was, Is and Will Be (1852), Sir Richard Bonnycastle's posthumous account of raids and raiders in 1838.